This year is the 600th anniversary of the Battle of Agincourt that was fought between the English and the French. It was part of the Hundred Years’ War – which actually lasted for over 100 years! The battle took place on 25th October 1415 in Northern France. Won by the English who were led by Henry V, it is one of history’s most famous battles. It’s believed that between 7000 – 10,000 French soldiers were killed and that less than 200 died on the English side. 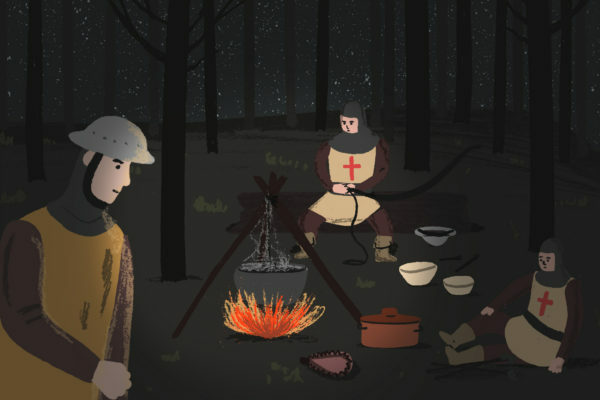 Even after 600 years we still talk, write books and make films about The Battle of Agincourt. 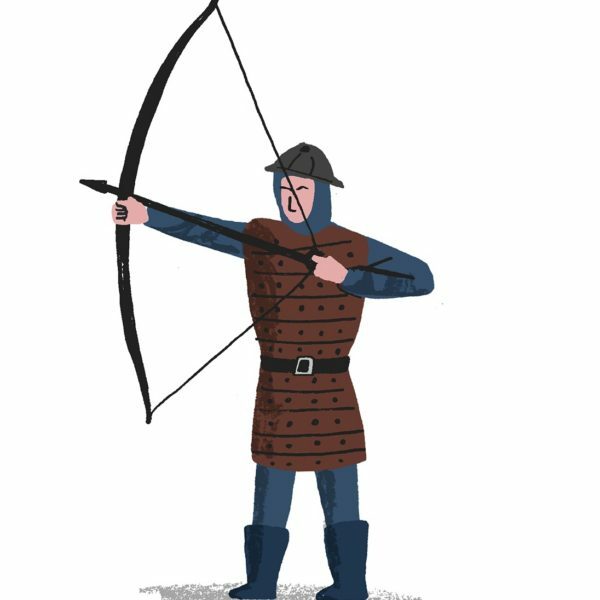 Although it was fought hundreds of years ago, we can still find out the names of many of the soldiers and archers who travelled with Henry V to France in 1415. More details can be found on the Medieval Soldiers Database website. One of the archers was a man called Nicholas Turner who, along with a William Turner (his brother perhaps?) went with Lord Camoys to Agincourt. Lord Camoys had a manor house in Sussex and is buried there, so perhaps the Turners came from Sussex – although we can’t be sure. Without good, reliable sources, it can be hard to construct a picture of a person from the distant past. We often have plenty of material to conjure up the characters of very powerful historical figures – such as kings and queens – even if some of that material might not always be a faithful representation! But it can be very hard to get an idea of what ‘ordinary’ individuals were like, and who they really were. Nicholas Turner might have been an extraordinary person, but now probably the most personal thing we know about him is his name. In his poem ‘The Chimney Boy’s Story’, Wes Magee explores in a few short verses the life of someone now lost to history – a young chimney sweep – and takes on his character to give us an insight into what his life might have been like. This poem offers us a unique way to picture the daily life of someone who lived many, many years before us. Let’s try to construct a similar picture of Nicholas, our almost-unknown soldier. Although we might not know much about him personally, we can trace his movements leading up to the Battle of Agincourt. We know that he would have first arrived with the rest of Henry’s army in north-western France, where the English soldiers began laying siege to the port town of Harfleur. A siege is a military tactic in which soldiers completely surround an enemy town or building, cutting off the essential supply of food until the people inside usually have no choice but to surrender. We know that this siege lasted five weeks – do you think these would have been weeks of inactivity and boredom for Nicholas and his fellow soldiers, or five weeks of hard work? The English soldiers ultimately succeeded in capturing Harfleur, but after so many weeks of long, drawn-out waiting, do you think Nicholas would have been in the mood to celebrate? And how might he have felt about being part of an army which caused so many weeks of hardship to innocent townspeople? This might not seem like a particularly chivalrous way to behave. Chivalry was a key code of conduct at this time, and was taken very seriously. Knights were to fight fairly, prisoners were to be treated well (often because, if they were important people, they could later be ransomed for a lot of money!). People were told to believe in God and follow the rules and teachings of the church, and to always have impeccable manners. Chivalry was, in effect, a code of conduct binding together the whole of Europe. Books were written about the rules, novels and songs written about great chivalric deeds. Perhaps the best known of these is the Morte d’Arthur, the first published version of the stories of King Arthur and his knights of the Round Table, written in the late fifteenth century – not so long after the Battle of Agincourt. Perhaps Nicholas saw himself as, or was trying to be, the perfect chivalrous knight. Perhaps he wasn’t so sure about this very particular, not always very practical, code of conduct. John Heath-Stubbs poem ‘The Carrion Crow’ gives us a vision of another famous fifteenth century battlefield – the Battle of Bosworth – which certainly doesn’t seem to have much that’s ‘chivalrous’ about it – it’s quite a bleak vision of a very famous piece of history. The Battle of Agincourt might not have been so very different. How would Nicholas be feeling during this march? What would he be talking to his fellow soldiers about? What would he be looking forward to? Would he be hoping to have a rest? A wash? Decent food? No such luck, for now at least. The French army is spotted – hugely outnumbering the English soldiers. The English must prepare for a battle. Let’s follow Nicholas into the English camp. Look carefully at the picture below. It is how we imagine it might have been in camp the evening before the battle. Imagine that one of these soldiers is Nicholas Turner. This might well have been one of the most important moments of Nicholas’ life. This moment is also the eve of ‘St Crispin’s day’. Many calendar days in medieval and early modern Europe were (and some still are) named after different saints of the Christian church. Just like Nicholas, no one is sure who exactly St Crispin was. Different versions of his life have him living variously in Rome, England and France, where he risked his life for his beliefs. One thing we do know, however, is that Crispin was the patron saint of shoemakers! In the Middle Ages and beyond there were saints for almost every aspect of life, from having your tooth taken out to bringing in a good harvest, and they were a very important part of daily life. Perhaps Nicholas would have been thinking about St Crispin at this moment, and asking him to help him find some courage for the battle ahead. Write a poem in which you take on the voice of Nicholas at this very moment in time. Just like the examples above, you are going to give us a glimpse of a person who, until now, has been swallowed up by the past – you are going to let us imagine what it was like to be this soldier, fighting 600 years ago. To help you get into the character of Nicholas, draw up a list of questions you would like to ask him, and then do your best to answer them yourself, using all the information we have about Nicholas, his journey, and the kind of world he lived in. Use this as the basis for your poem. Perhaps the events of the past few weeks – the siege at Harfleur, the long , hungry days of marching, the sudden shock of seeing the French army – are uppermost in Nicholas’ – in your – head. Perhaps you want to escape from these thoughts at this moment, and instead think about the home you’ve left behind. This could be your chance to really create a past, and a distinct character, for Nicholas. You can decide what hobbies he might have had, what kind of work he would have done, what his family and friends were like. In this poem, you are Nicholas, and so it’s completely up to you. Think about the tone you might take –which will depend upon how you decide you want Nicholas to feel at this moment. Look back at ‘The Chimney Sweeper’s Boy’ – the voice of the chimney sweep here is very heavy, and he sounds quite sad and hopeless. Alternatively, Langston Hughes poem ‘I, Too’, which again takes on the speaking voice of a person lost to history, someone considered ‘unimportant’ at the time – is a bit fiercer – there’s and ambition in this person’s voice. Think about how these poets have created their personas, using, for example, descriptions of their environment, their physical sensations, pieces of everyday speech, and see if you can do something similar to create the character of Nicholas. We have produced a new free, downloadable lesson plan to support this challenge, which explores some of the history and themes surrounding the battle and encourages students to create their own poems, thinking particularly about descriptive and emotive language.